BOSTON, MA – For the first time since 1988, the Huskies will have two banners hanging in TD Garden. The Northeastern University men’s hockey team defeated Boston College 3-2 on Saturday night. 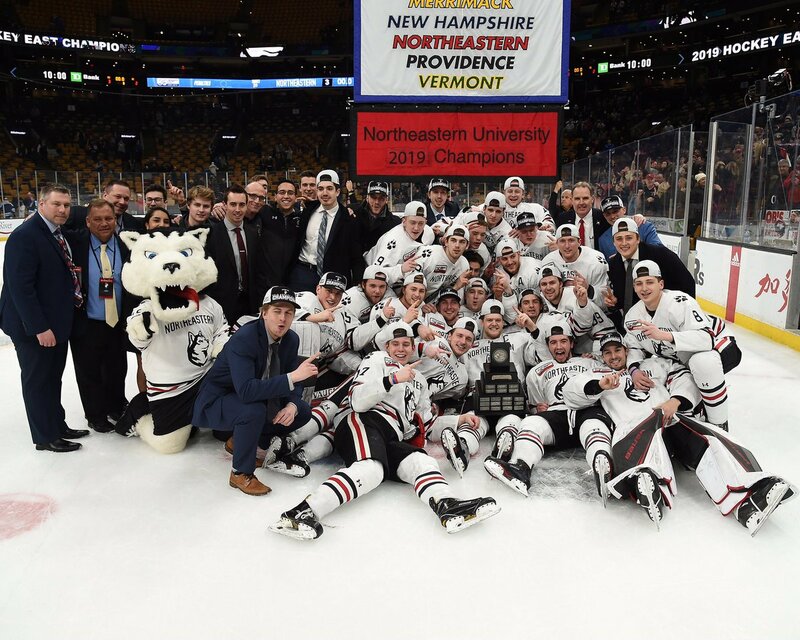 Northeastern won their first Hockey East Championship since 2016, and the Eagles season ended as they will not qualify for an at-large bid in the NCAA Tournament beginning next week. The game nearly began with a BC goal when sophomore forward Logan Hutsko knocked a puck into the net from his stomach. The officials ruled he used his arm to bat the puck in and disallowed the goal. The Huskies got off to an out-of-character fast start, piling high danger scoring chances on junior goaltender Joe Woll early in the first period. The first beat him at 2:31 of the opening period when junior forward Matt Filipe picked up a rebound from a shot from senior forward Brandon Hawkins and deposited it in the net behind Woll. The Huskies put another one the board quickly when Hawkins ripped a shot into the glove of Woll who failed to secure it. The loose puck sat in front of him when junior defenseman Ryan Shea took another shot off Woll’s right pad. The rebound was kicked right to Hawkins who was able to snap a wrist shot and make it 2-0. Hawkins scored another in the first period on the power play. The odd-man advantage was an absolute clinic from Northeastern who began the power play and did not let the puck leave the zone once. With five seconds remaining on the advantage, Hawkins fired his third shot of the period past Woll and gave NU a 3-0 advantage. With that goal, Hawkins became the first play to score two opening period goals in the Hockey East Championship game since Johnny Gaudreau in 2012 for BC. In the second period the Eagles came out buzzing. Junior defenseman Jeremy Davies took a penalty with 2 seconds left in the first period which allowed BC to start the period on the power play. Just 18 seconds into the period freshman forward Oliver Wahlstrom tallied his eighth goal of his freshman campaign. Just over 90 seconds later, junior forward David Cotton netted his 23rd of the season. The Parker, TX native had eight total shots on goal and a very complete two way game. Despite an onslaught of offense in the third period, sophomore goaltender Cayden Primeau had yet another performance for the ages. Finishing the game with 38 total saves, his performance along with the Northeastern defense stymied the Eagles in the third and time expired as the scoreboard read NU 3, BC 2. He ended the game with 38 total saves, and earned yet another piece of personal hardware, the Hockey East Tournament MVP award. The Hockey East All Tournament Team included Primeau, Shea, Davies, Hawkins and sophomore forward Zach Solow. Cotton was the lone non-Husky to make the team. Madigan’s opening statement definitely summed it up for everyone at Norhteastern.